Dive into Moroccan culture with our authentic cooking experience! Morocco is famous for its flavourful cuisine, with its variety of dishes, freshly ground spices and seasonal produce thanks to the warm, North African climate. Join us for an unforgettable day of food, colour and Moroccan flavour. Spend the morning exploring the bustling Souk Aourir – a weekly farmer’s market in our neighbouring village – where we source all of the fresh, organic ingredients for our weekly menu. 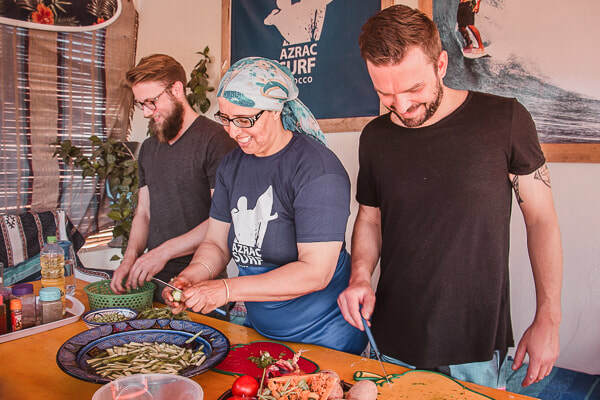 After a morning of marvelling at the colours and tastes of all the fresh, yummy ingredients that will go into your Moroccan dish, join us in our rooftop kitchen for an authentic cooking lesson with our Moroccan chef, Fatima. You’ll learn how to prepare and cook Tagine – a traditional Moroccan dish slow-cooked to perfection and full of flavour. Once the Tagine is ready, we’ll share the dish on our rooftop dining area with freshly baked bread and some sweet mint tea.